Fellow in the William H. Scheide Reading Room. 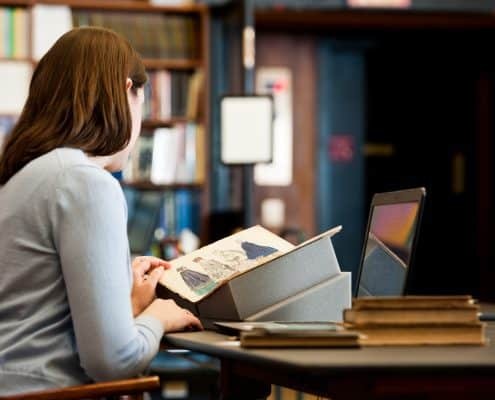 Over the course of its 32-year history, the Library Company’s fellowship program has supported more than 1,000 researchers in fields as diverse as American Studies, Art History, English, History, Media Studies, Political Science, Religious Studies, Sociology, and Theater. Our fellows have authored hundreds of books and articles, presented at thousands of conferences across the globe, and reshaped fields. As so many of our fellows have reported, the Library Company is more than a research library—it’s a scholarly community nourished by expert staff, devoted patrons, and generous colleagues. A researcher may enter that scholarly community on a fellowship, but they need not forfeit their place in it when they return home. Join the Commons: Enroll in the virtual community, share preferred contact details, and opt to receive occasional emails with new opportunities tailored for current and former fellows. Share Announcements: Share announcements, including promotions and publications, which you may request we promote in print and digital media outlets, blog posts, or podcast interviews. Social Media: Browse recent announcements we have circulated in digital media outlets. Publications: Browse publications from alumni of the fellowship program. If you have published an article or book not listed on Fellows Articles or Fellow Books, you may submit updates through Share Announcements. Events: Discover events at the Library Company featuring current and former fellows. Podcast: Learn about your colleagues discuss work through the Library Company’s monthly podcast series, Talking in the Library. Generous support for this fellowship program has been provided by the Andrew W. Mellon Foundation, the National Endowment for the Humanities, the Albert M. Greenfield Foundation, the Barra Foundation, the McLean Contributionship, the William Reese Company, ASECS, and William H. Helfand. Dr. Will Fenton is the Director of Scholarly Innovation at the Library Company of Philadelphia and Creative Director of Redrawing History: Indigenous Perspectives on Colonial America, funded by The Pew Center for Arts and Heritage. Will earned his Ph.D. at Fordham University, where he specialized in early American literature and the digital humanities. He is the recipient of prestigious fellowships from the American Philosophical Society; Haverford College Quaker and Special Collections; the Humanities, Arts, Science, and Technology Alliance and Collaboratory; the Library Company of Philadelphia; the Modern Language Association; the New York Public Library; and the Omohundro Institute of Early American History & Culture. His digital scholarship includes the digital exhibit Americanization: Then and Now, co-developed with the American Philosophical Society; the online research guide Diaries Held at the American Philosophical Society, which canvases more than 1,700 journals; and Digital Paxton, a scholarly edition, digital collection, and teaching platform devoted to Pennsylvania’s first major pamphlet war, co-sponsored by the Historical Society of Pennsylvania and the Library Company of Philadelphia. Digital Paxton was awarded first prize in the NYC Digital Humanities Graduate Student Project Awards (2016-17) and a Lapidus Initiative Fellowship for Digital Collections (2018). Will’s writings have appeared in academic journals (American Quarterly, Common-Place, and ESQ); academic blogs (HASTAC, MLA Connected Academics, Omohundro Uncommon Sense, and the Organization of American Historians); and public platforms (including Slate, Inside Higher Education, and PC Magazine).